BELIZE CITY, BELIZE, Friday, 8 December 2017 (CRFM)—The Caribbean Regional Fisheries Mechanism (CRFM) and its partners at the Japan International Cooperation Agency (JICA) recently held a wrap-up meeting in St. Lucia at which the outcomes of the novel Caribbean Fisheries Co-Management Project (CARIFICO) were unveiled. The most important benefits underscored are better catches and improved incomes for fishers who began using Fish Aggregating Devices or FADs. These were designed, constructed, deployed and managed in a cooperative manner by the fishers themselves in collaboration with government officials and with support from the Japanese experts. Fishers from the pilot countries attended the meeting in St. Lucia and shared how the project has positively impacted them. Fisheries officials from the CARICOM countries, except for Bahamas and Belize, also attended. International partners from JICA, fisheries experts deployed in the region and officials from JICA headquarters in Japan, as well as representatives from the Embassy of Japan in Trinidad and Tobago, the Caribbean Network of Fisherfolk Organisation, the Organisation of Eastern Caribbean States (OECS), and the University of Florida were also present. CRFM Executive Director Milton Haughton said that he is impressed with the progress made in introducing co-management approaches in specific fisheries, as well as the level of investment of fishers in the process. Fishers have formed new fisherfolk organizations which are actively participating in the development and management of the target fisheries as a result of the CARIFICO project. Through the project, Governments in the 6 pilot countries are sharing more authority and responsibility for fisheries development and management with stakeholders by improving relations and communications, and promoting increased participation by them in decision-making in fisheries. “They have seen significant social and economic benefits from working together and operating around the FADs. The fishers have been involved in the construction and deployment of the fishing gear, as well as developing rules to regulate activities around the FADs and collecting and fisheries data. This is a tangible example of what fishers can achieve by collaborating with each other and with the government,” Haughton said. The Project Manager of the pilot project in Grenada, Mr. Toby Francis Calliste, said that they have learned a lot from the CARIFICO project. He noted that the fishing communities of Grenada have realized tremendous benefits through the co-management arrangement. The CARIFICO project has transformed the fishing industry in Grenville and by extension in Grenada, said Calliste, who presented on the impacts of the project in Grenada. Dominican representatives said that fishers in that country embrace the important benefits of the FAD program. They add that the Roseau Complex fishers now exercise greater compliance with FAD management practices. They hope that with the sustained deployment of public FADs, user conflict will be reduced. The CARIFICO-CRFM Joint Statement on Fisheries Co-Management, which is to be tabled at the April 2018 meeting of Fisheries Ministers from CRFM Member States, envisions the way forward. It addresses four areas: Support for Implementation of Co-management; Training in Support of Co-management; Co-management to Address Climate Change and Disaster Risk Management; and Public Education and Awareness. The statement is intended to solidify the support of CRFM Member States for the implementation of the recommendations of the CARIFICO Project and the advancement of co-management, as well as improved fisheries governance in the Caribbean. This should include legal and institutional reforms, training and capacity development, public education and awareness building, and empowerment of fishers’ organizations and fishing communities. Fisheries are an important source of food, income and cultural identity for Caribbean communities. While reef fisheries in the Caribbean are frequently over-exploited, offshore pelagic resources also targeted by the US sport-fishing industry may generate alternative economic benefits and divert pressure from reefs. Key to the efficient harvesting of thinly-distributed pelagic fish is the use of fish aggregation devices (FADs). Traditionally, FADs were deployed by individuals or close-knit groups of fishers. Recently, governments have deployed public FADs accessible to all. There is concern that public FADs are exploited less efficiently and produce conflicts related to crowding and misuse. 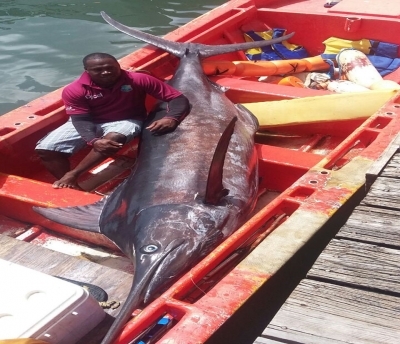 In partnership with Counterpart International, the Caribbean Regional Fisheries Mechanism and the Dominica and St. Vincent and the Grenadines Fisheries Divisions, Florida Sea Grant collected information from fishermen on their use of FADs that were deployed privately, by small groups or by the government. This allowed for a determination of governance arrangements that were most profitable and provided input to stakeholder meetings with FAD fishers to identify best practices for sustainably using and co-managing FADs. The fishing trip analysis shows that catch and profitability are higher when FADs are managed privately or by small groups and access to the aggregated fisheries resources is somewhat restricted. An engagement strategy that introduced an activity planner as a best practice to increase information sharing helped strengthen the rapport between government and fisheries stakeholders. Study results are helping shape regional implementation of policy, which favors FADs co-managed by fishers and government, but can benefit from positive aspects of FADs managed privately or by small groups. To promote the fisheries resource management in the Caribbean region, the Caribbean Community (hereinafter referred to as “CARICOM”) member states agreed to inaugurate the Caribbean Regional Fisheries Mechanism (hereinafter referred to as “CRFM”) in March 2003. 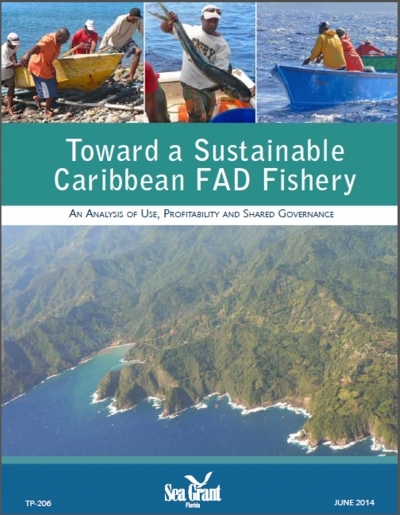 In response to the request from the CRFM member countries, GOJ through JICA implemented a technical cooperation project on “Formulation of Master Plan on Sustainable Use of Fisheries Resources for Coastal Community Development in the Caribbean” (hereinafter referred to as the “Study”) from 2009 to 2012. The Final Report of the Study proposed (1) to establish practical co-management models for sustainable use and management of the fisheries resources, (2) to promote participatory resource management and development toward co-management, and (3) to formulate and strengthen the regional network by sharing the local expertise and lessons learned in each country.